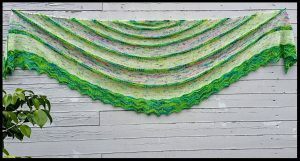 The second shawl design from Star Fiber Studio is Punkte. Punkte is a big crescent shaped shawl in mainly stockinette, with textured color changes, and an eyelet chevron border. Punkte is German for points, the name is tied in with the border section of the shawl, making nice pointy edging from chevrons. Punkte was inspired by the fresh summer evenings when you just want to wrap yourself in a big comfy shawl, also perfect to wear just as an accessory in your wardrobe. It is designed to knit in three colors, but let your imagination take over, you can knit every section another color, making it a perfect project for stash busting. 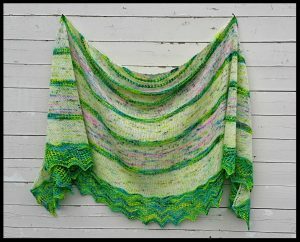 This is a written pattern, and that is also within reach of an adventurous new shawl knitter if knitted a few shawls before.